Dental emergencies are not known for being convenient and well-timed. Quite the contrary – far too often, they strike when we’re least expecting them, inducing panic and stress. At Dr. Ayer’s practice, you can rely on our team always being in your corner when you need us most. We strive to accommodate emergency situations as soon as possible; in many cases, we can even make time to see you and provide relief on the same day as your initial call. If you’re located in Leawood, KS or a nearby community, don’t hesitate to pick up the phone! Why Choose Dr. Dennis Ayer for Emergency Dentistry? Whether he’s rebuilding missing teeth from the ground up or alleviating the pain of severe oral infections with root canal therapy, Dr. Dennis Ayer can be considered a true dental expert. He has been serving Leawood patients since 1984 and has logged well over 3,500 hours of post-graduate continuing education in addition to his practical experience. He also utilizes the latest modern technologies in order to make diagnostic care and treatment planning as comprehensively confident as possible, including all-digital X-rays and intraoral cameras. 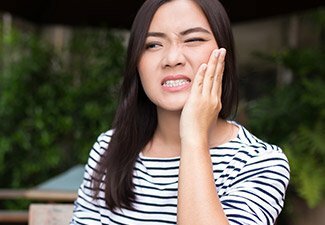 Dental trauma can occur suddenly and unexpectedly, whether patients are rushing down the stairs at work or participating in a pick-up basketball game with friends. If you’ve fractured a tooth, partially dislodged a tooth, or even knocked out portions of your smile altogether, Dr. Ayer strongly recommends that you pick up the phone immediately. There is typically a small window of time available to successfully rehabilitate these teeth. In the meantime, the use of gauze and a cold compress can help reduce uncomfortable symptoms like bleeding and swelling. If one or more teeth have been entirely lost, we urge you to try gently placing them back in their sockets or storing them in a container of milk until you reach our Leawood office. Oral infections (also commonly referred to as “toothaches”) are likely to develop over time if a patient is not brushing and flossing properly at home. Patients will likely experience noticeable pain or sensitivity in a specific area of the mouth, although these symptoms may also be caused by a caught piece of food or foreign debris – our team recommends flossing and rinsing the mouth first to rule out this possibility. 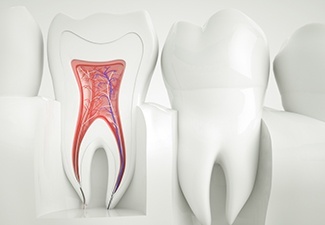 A root canal can be performed to remove harmful bacteria within the tooth and restore its health, so don’t hesitate to contact our Leawood practice for further assistance. It’s a priority for Dr. Ayer to help patients maintain their complete, natural smile if at all possible. That’s why our team offers root canal therapy, a saving grace for severely damaged teeth that are facing possible extraction. During this procedure, we’ll carefully access the inner chamber of the affected tooth in order to thoroughly clean out bacteria. The area will then be sealed to reduce the threat of further infection. Finally, we’ll place a beautiful, lifelike crown on top that replenishes any lost structure, leaving you with a tooth that’s healthier and happier than ever. Dr. Ayer and the rest of our team will make every effort to help patients preserve their natural teeth and avoid the need for extraction, but there are certain circumstances (such as severe injuries or advanced decay) that may render this treatment option necessary. We will prioritize your comfort at every stage of the treatment process, providing sedation dentistry when requested. If the removed tooth or teeth need replacements, highly modern and lifelike options like dental implants are available right here in our practice. 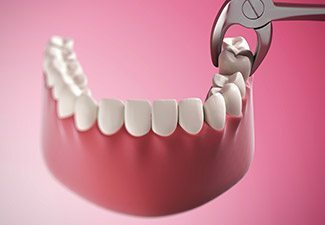 As much as our Leawood dental team tries to avoid it, extractions can sometimes be necessary in order to protect and preserve the health of a patient’s smile. 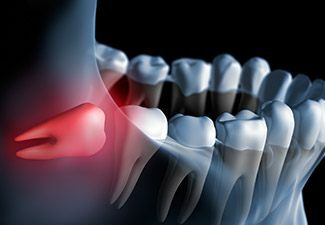 This is never truer than when your wisdom teeth begin to erupt, which can lead to a whole host of potentially dangerous problems. 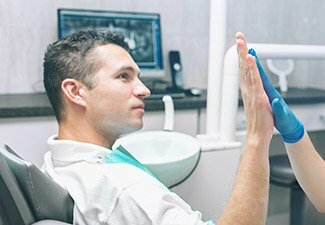 If Dr. Ayer inspects your unique smile and determines that extracting your wisdom teeth is for the best, then we’ll be sure to handle the procedure as precisely and gently as possible in order to minimize your discomfort or use on of his Oral Surgeons. Many patients struggle with feelings of anxiety and fear when faced with upcoming dental care, even if they desperately need assistance with an oral infection or a physical injury. Thankfully, sedation dentistry is available to calm the nerves and make this experience as stress-free as possible. If you think you may be the right candidate for sedation during your upcoming visit, don’t hesitate to contact us in Leawood.